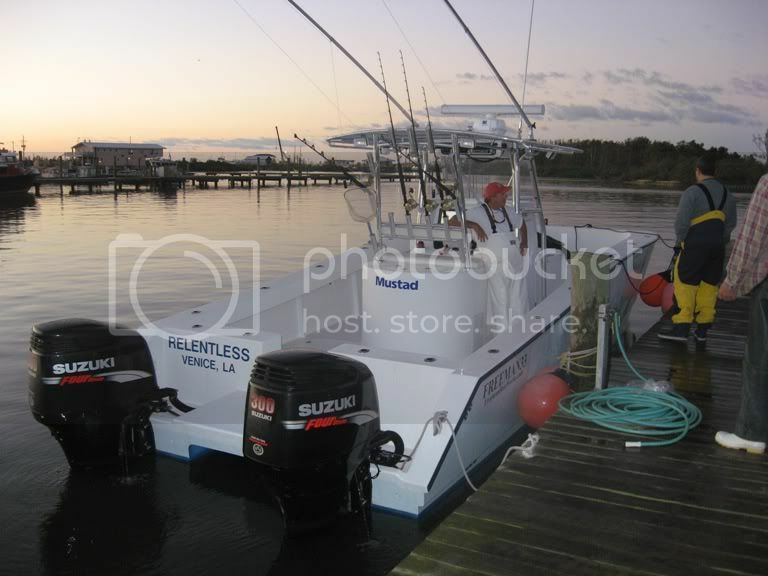 Here’s how the day went: Since we were supposed to meet Captain Mike of Relentless Sportfishing Charters at 6:00AM we agreed to get up at 4:45 AM. After having breakfast and getting everything we would be taking with us to the boat ready, we jumped in the car. When I start the car and look over at the clock I see that it’s not 5:45AM, as we’re expecting it to be, but 4:45AM. Everyone forgot to set their clock back for the time difference between Florida and Louisiana so we go back in and sleep another hour until it’s time to go. We were very pleased when we arrived at the boat. The 33’ Freeman was in spotless condition with excellent tackle and the captain and mate were ready to go! It was a beautiful day around 70 degrees with the sun shinning brightly. The weather would remain like that for the rest of the day and the seas were 2 feet or less. 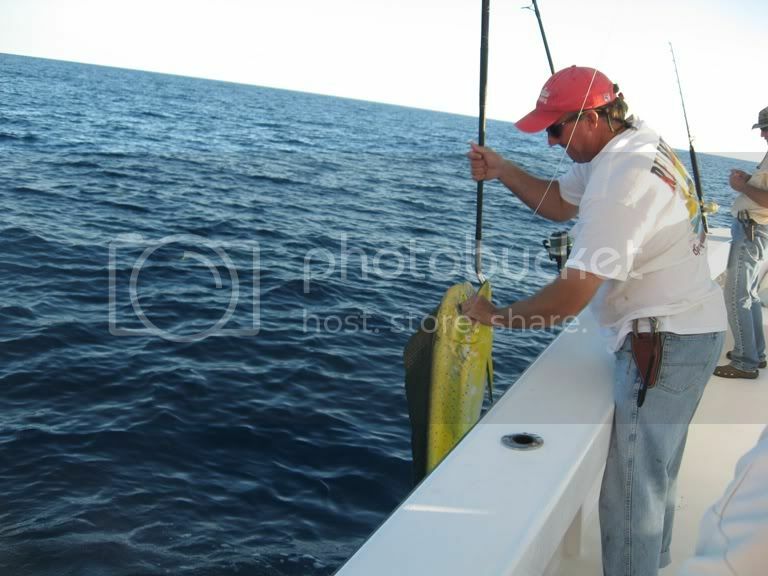 Catching bait on the way out was not difficult so at this point we’re convinced were going to tear the yellowfin up. Shortly afterwards is when we started to realize that things were not going to be as easy as we thought. 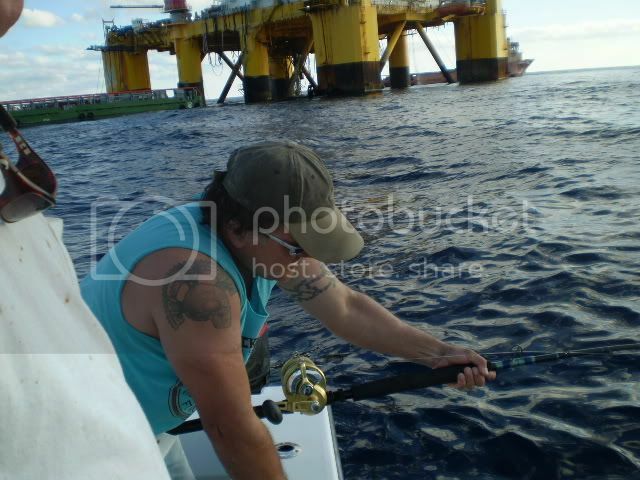 When we pulled up to the first rig, 70 miles offshore, we immediately start to mark big fish at the 200ft rage. We setup a slow troll consisting of live bait (Runners) which results in a small dolphin. 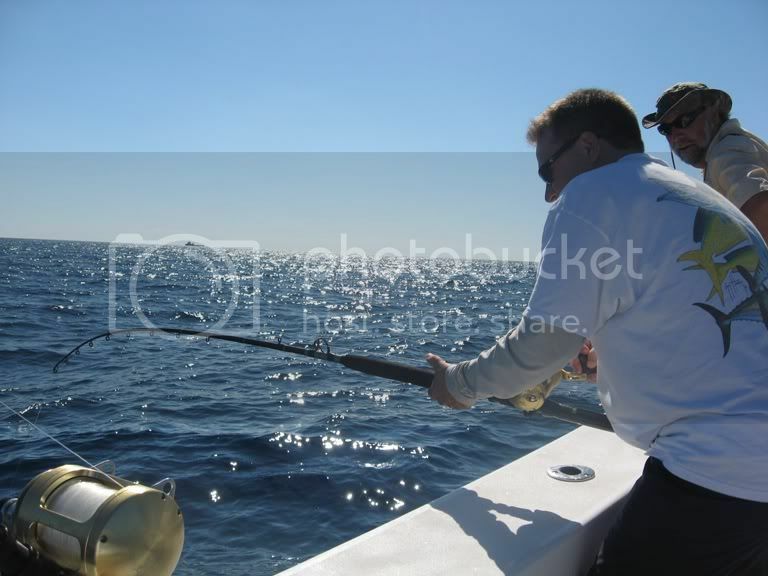 We continue to slow troll the area while casting out a popper on a spinning rod to small blackfin tuna busting on the surface. We only managed to get one black and decided to try another nearby rig. 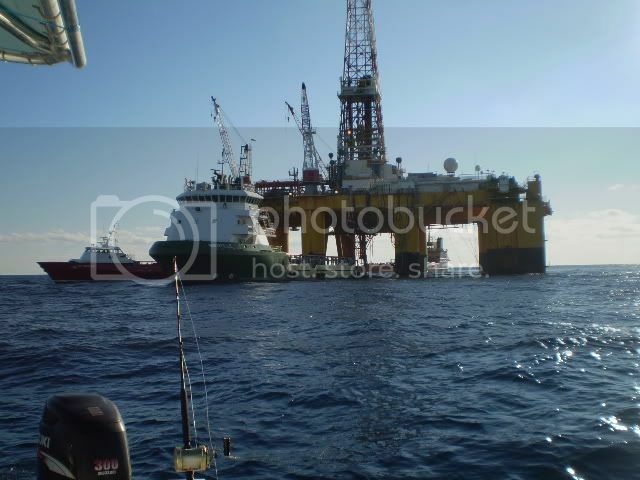 The second rig was also holding fish but they where not coming up to the surface. Since trolling wasn’t working the captain decided to change the approach and we start drifting baits in the 200-300 foot range in order to bring the baits down to them. Bingo, we get a bite. We fight the fish for a few minutes but managed to lose the first 4 solid hits we get. 0 for 4 on the yellow fins and now we are starting to worry. 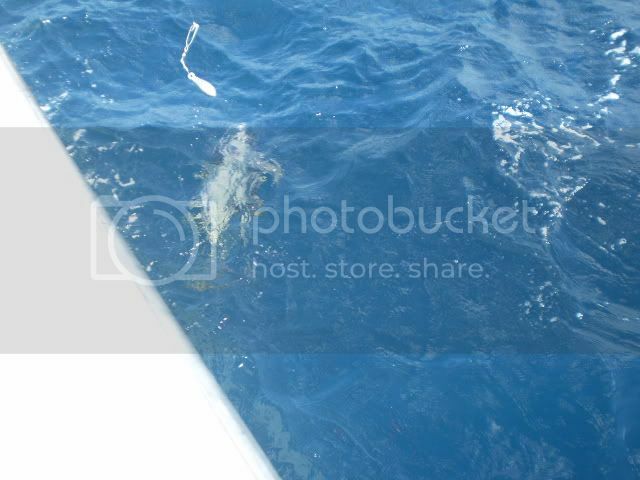 This brings us to approximately 4:00PM with no yellow fin on the boat. Now we have to make the decision of continuing another 20 miles and trying another rig or heading back home and giving it another try on Friday. With the way things were going it was a very tough question but after the captain advised us that the weather may be a little too sporty to go out on Friday the consensus decision was to continue on. 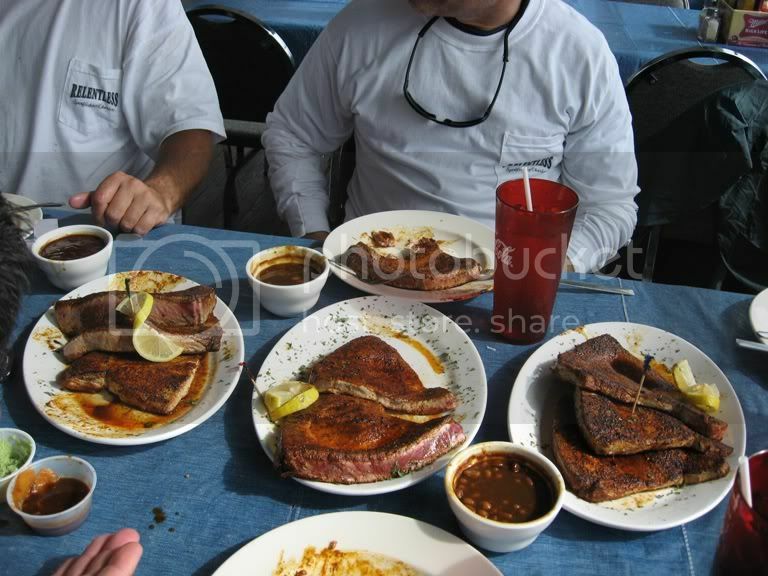 We were all determined not to return to Florida without catching our yellowfin and we were not going to take a chance on the following day. 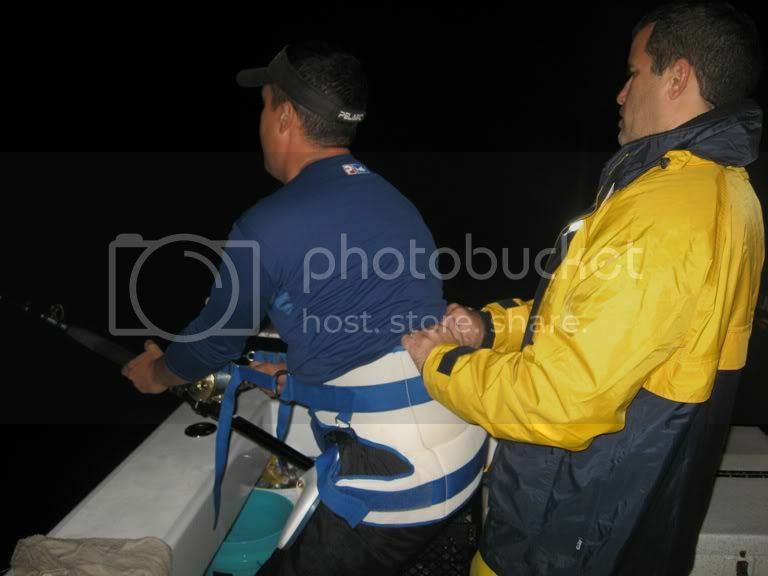 Our decision turned out to be the right one because we would not have been able to go out Friday because of the weather as the captain had advised us might happen and we eventually started to catch fish. We arrive at the last spot of the day and it immediately looks promising. We hook a large dolphin shortly after starting our troll but wouldn’t you guess it, it pulls the hook and add another lost fish to the list. 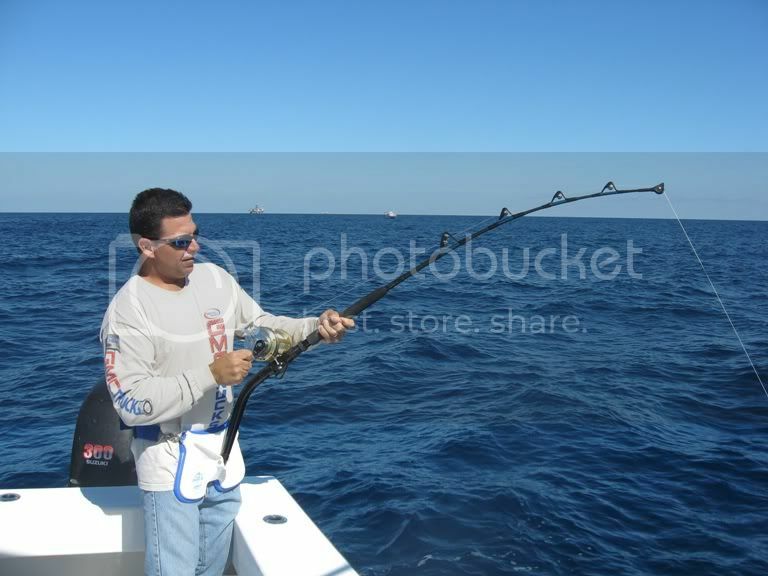 After we give up on the trolling we start setting up our drifts in the same manner which produced the bites at the other rigs. After several drifts without a bite we start to see more and more yellowfin crashing in the area. These were not small fish. They all looked over 100#s and our hearts where racing in anticipation of hooking one of these monsters. 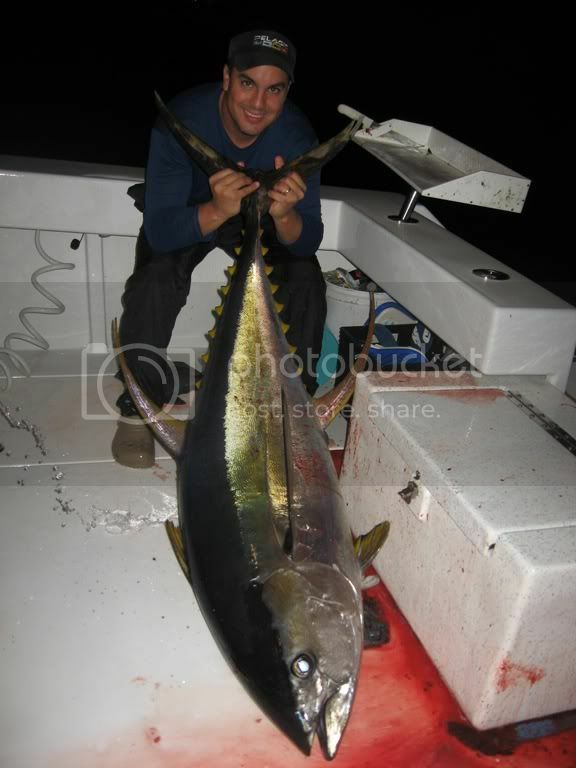 Finally, Rob breaks the ice and lands the first yellowfin in the 20#s. range. At this point we’re all thrilled to have the first one in the boat when things really start to heat up. Just as the sun is about to set Alexis gets a bite. It’s a big fish but we’ve gotten awfully close to the rig and the fish is digging down. At the same time a group of 30#s dolphin who had been swimming around the boat each time we approached the rig decided to also start to bite. 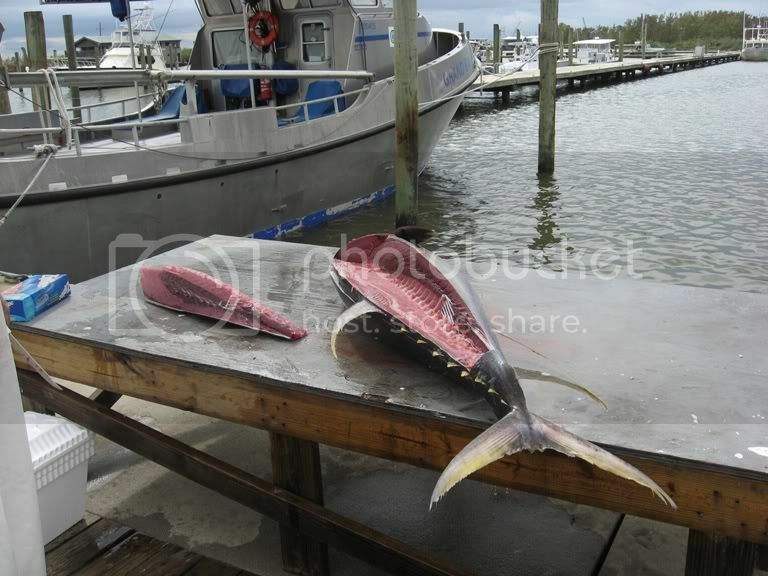 We lost the tuna but landed three of the dolphin. At this point we’re convinced our luck had changed and we were correct. 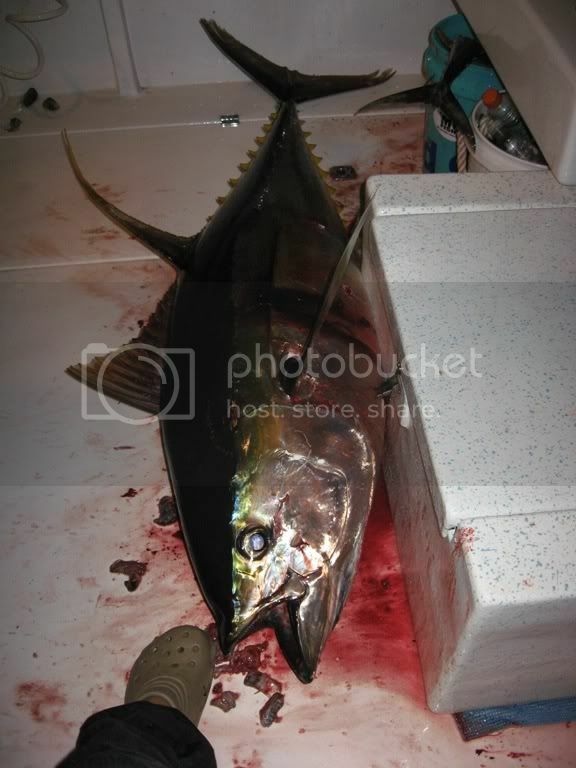 Next thing we see is the small yellowfin caught earlier pulled out of the ice and getting filleted. Sweet sashimi time, so I thought, it turned into chunks and they started going overboard. A concerned look on my face was immediately relieved when yellowfin after yellowfin got hooked on the chunks. We hooked and landed every fish after that. 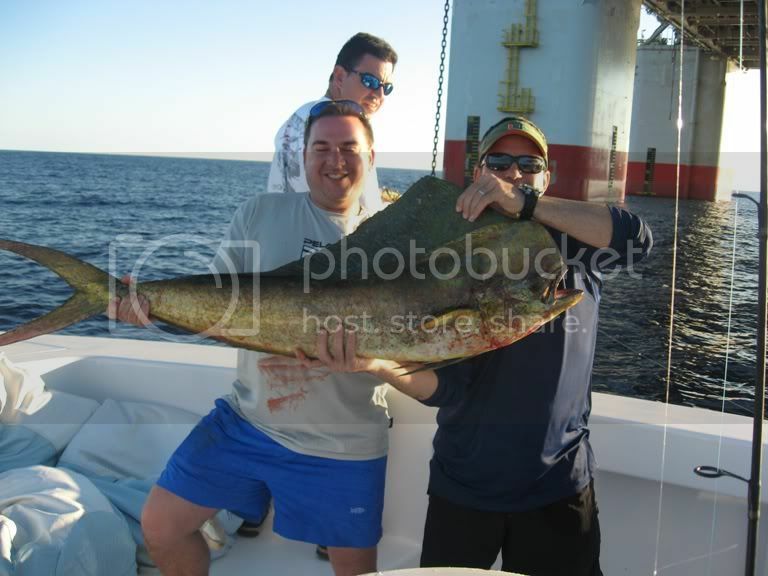 We kept the bigger fish weighing in at 145#s, 135#s, 80#s and 75#s. To say we ended on a high note is an understatement. 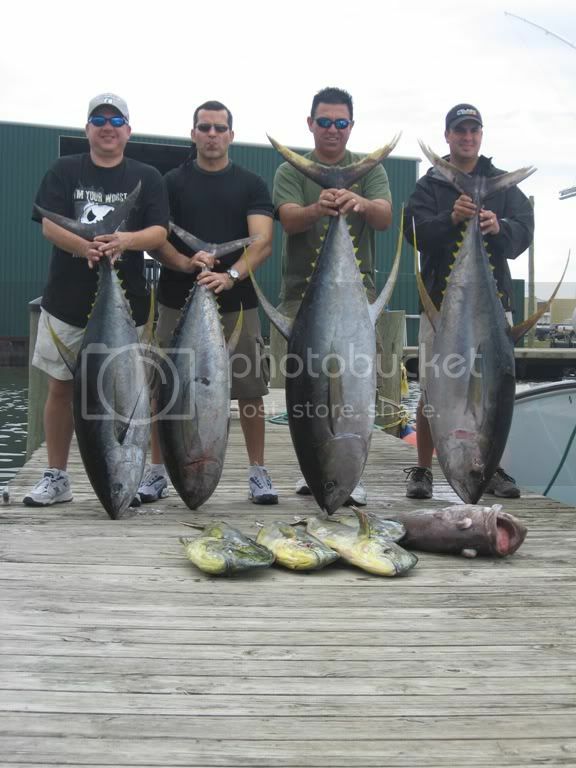 If you’ve never caught a tuna over 100#s make sure you’re in pretty decent shape before making the trip. These fish will absolutely kill you. We all have sore muscles we never even knew existed. 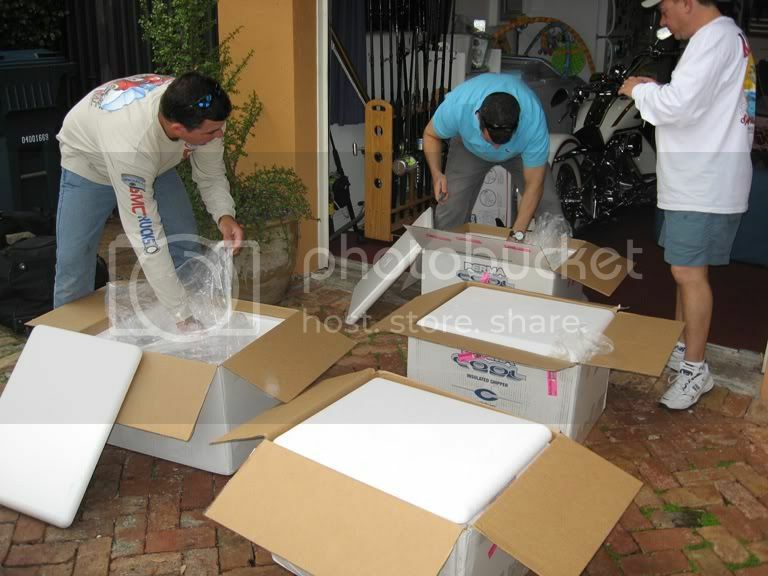 Special thanks to Captain Mike Ellis, from relentless sport fishing, for going the extra mile and putting us on fish. It’s nice to fish with a Captain that has as much passion and hurts as much as you do when a fish is lost. His boat was very impressive and comfortable. The fuel efficient vessel was very appreciated especially at the end of the day when you’re settling fuel cost. He never gave up on us when things just weren’t going our way and the results were spectacular. 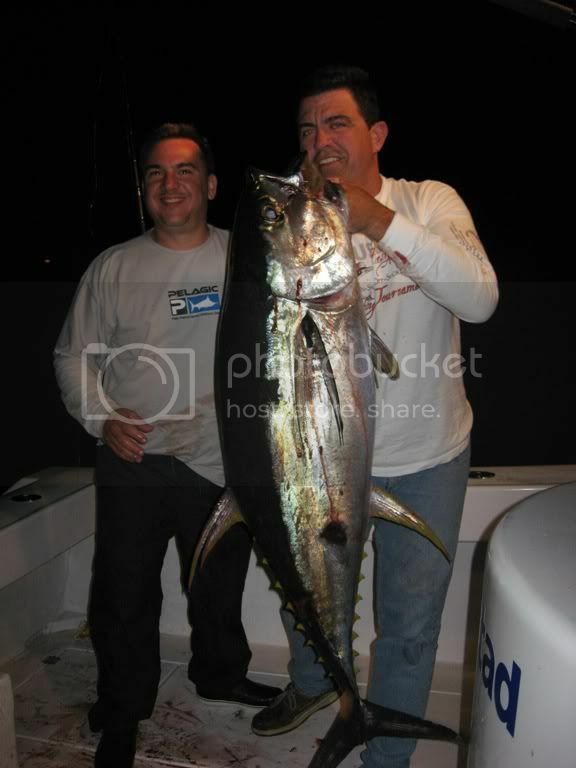 If you would like to charter Captain Mike his contact information can be found on his website: https://www.relentlesssportfishing.net. Highly recommended!! The last couple of weeks is a prime example of why Louisiana is the sportsman’s paradise. I left the deer camp in time to drop off a couple of deer at the processers and head to Venice for six days of fishing. I tried to squeeze a duck hunt in between all of this but I couldn’t seem to wake up. But I missed a easy and quick hunt with limits for everyone. Now on to the fishing. I started this series of trips off with Franklin Hedley and his buddies from South Carolina. I had a tough act to follow since the last time they fished with me this summer we put 13 yellows in the boat and was home early. This trip sarted off on the right foot with all the mullet you would ever want and plenty of perfect hardtails. 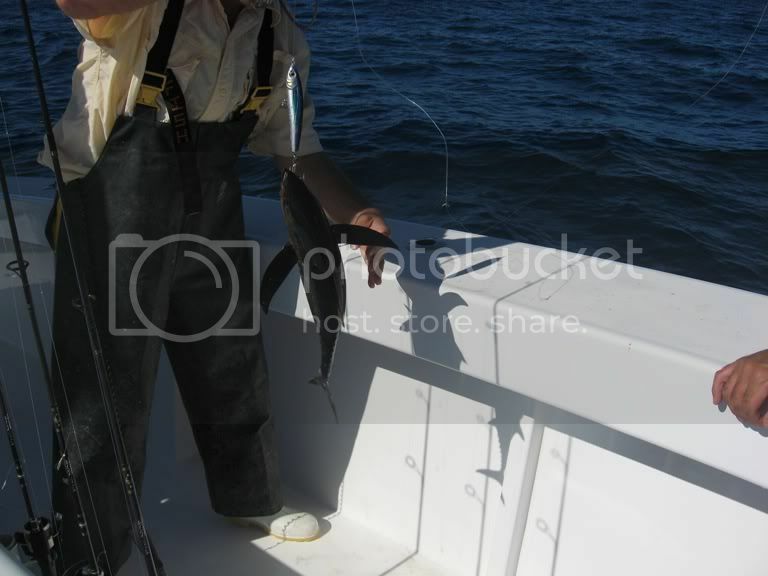 The first fish of the day was a blue that popped up behind a mullet but he would never commit to eating. After that the grand tour of the gulf started we hit three more rigs and at the third rig we finaly managed to get something in the box a 29” yellowfin. The day was really not going well for us at this time. But I still had one more rig to hit. Thankfully this rig was holding some dolphin and we quickly put five very nice dolphin in the box for a pretty decent consolation prize. If you wanted to count all of the cudas it was a banner day for them. The following day I had Steve Gibishar and his wife out for Steve’s 50th birthday. I was going to write something up but he beat me to it so I am just going to be a little lazy and copy his post. Well we decided to go with Capt. 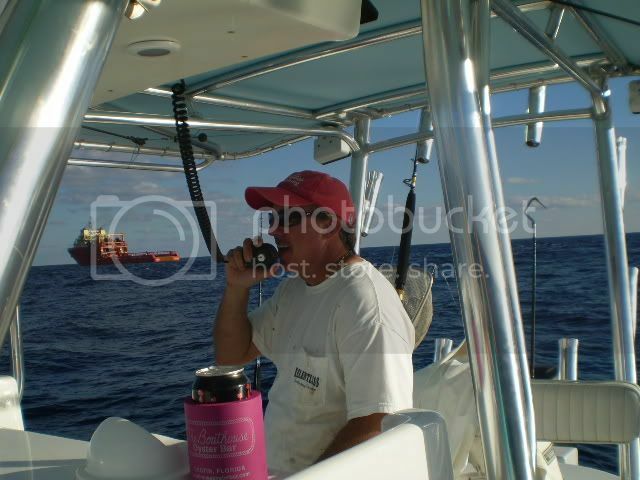 Mike Ellis on Relentless for my 50th birthday fishing trip. It was definitely a good call. Capt. 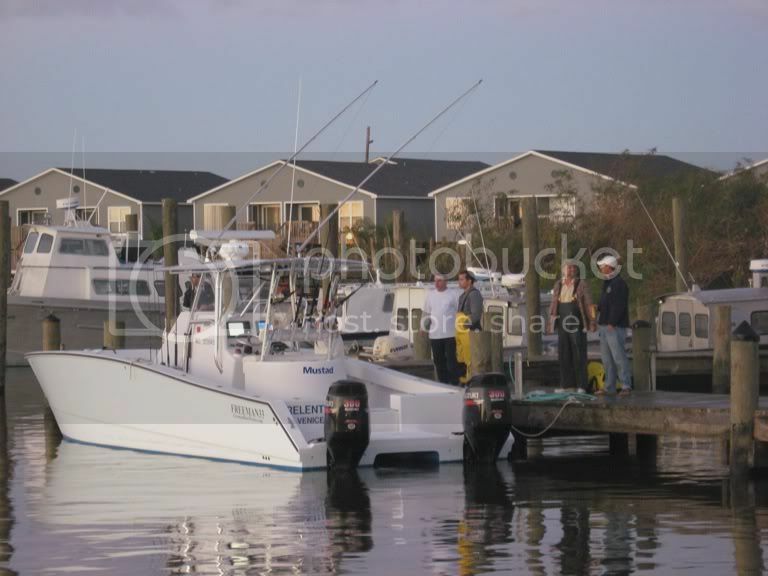 Mike has a very appropriate name for his business and boat as he was the most tenacious capt. I’ve ever fished with. He was relentless in trying to get us our tuna. I don’t think I’ve ever fished with a harder working capt. and he was a genuinly nice guy. We’re already trying to figure out how soon we can afford to go again. 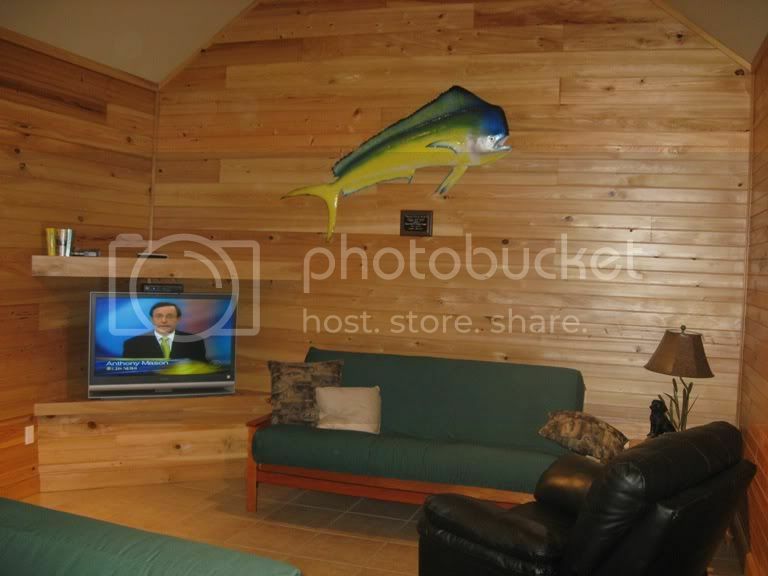 One thing that differs from trips in Venice to trips in Florida is that you pay for a trip, not a specific amount of hours. 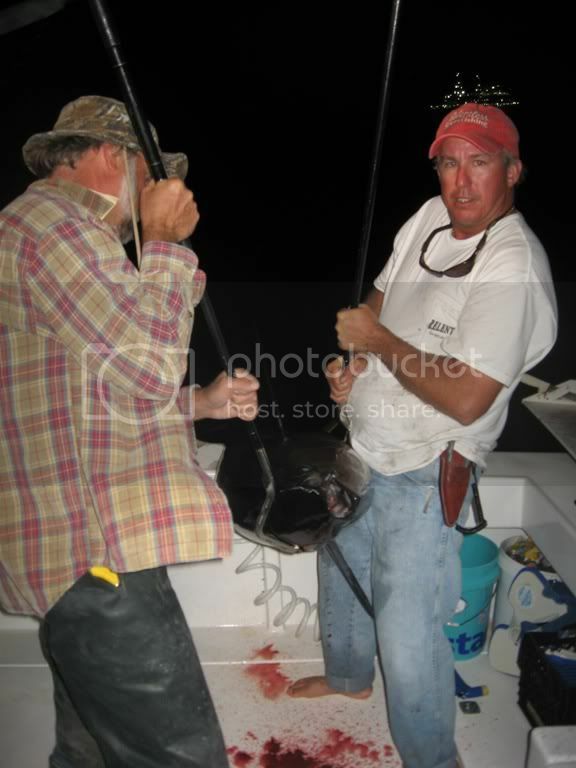 I’ve been on boats out of Destin where we didn’t have much fish when the bite picked up, only to have the capt. tell us that we were out of time and had to head back in. But for 175.00 an hour, we could stay out longer. With Capt. Ellis, we paid for a trip, and he was going to do whatever it took to get us our fish. We left at 6:00 in the morning and got back in at around 7:30 PM. The bite started late and he was determined to get us our fish. I spoke with him a few days after the trip and he said that he didn’t get back in till midnight on his trip the day after ours. That’s determination! 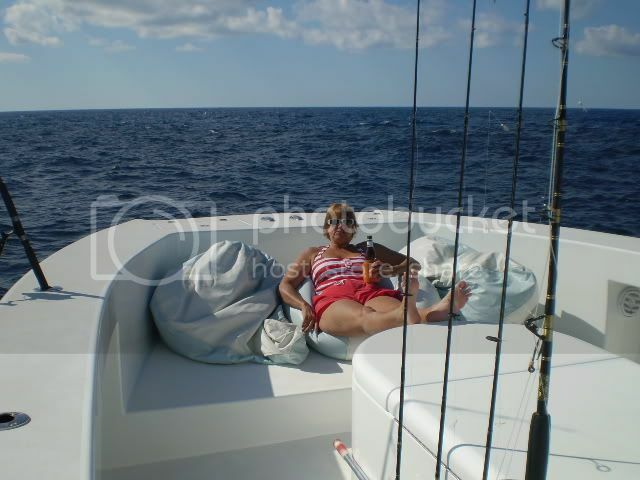 My wife Char thought the boat was comfortable. 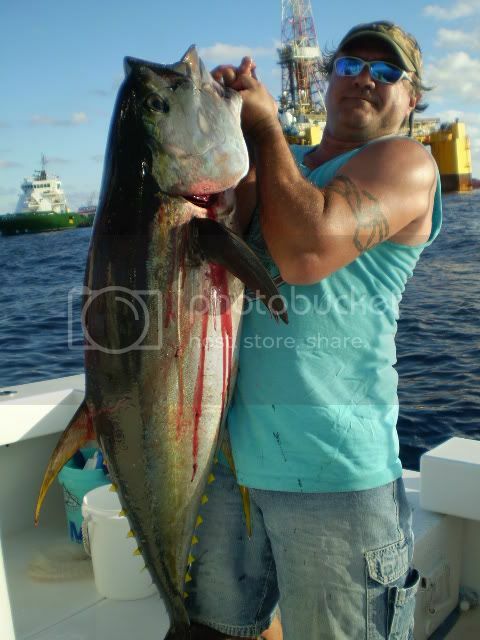 Here’s our fist of four tuna coming up. I’m whooped on this one, it was a little bigger than the others. This is what we went there for. 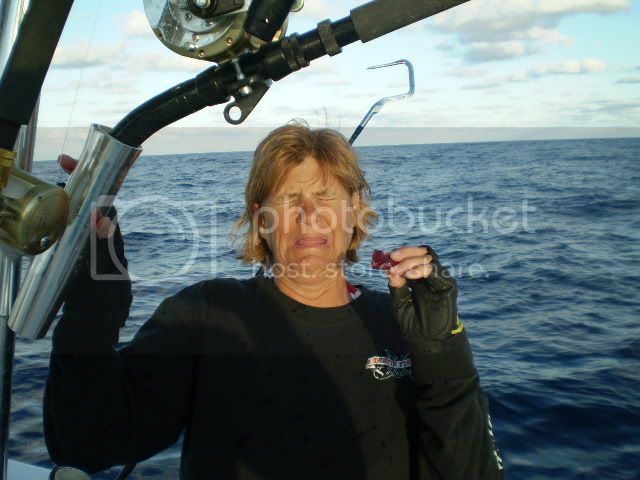 My wife savoring the heart of her first yellowfin. My wife with one of her three dolphin, all about the same size. The final result, four yellowfins and three dolphin. I want to thank all the people who recommended Capt. Ellis as the trip made for a very memorable birthday. 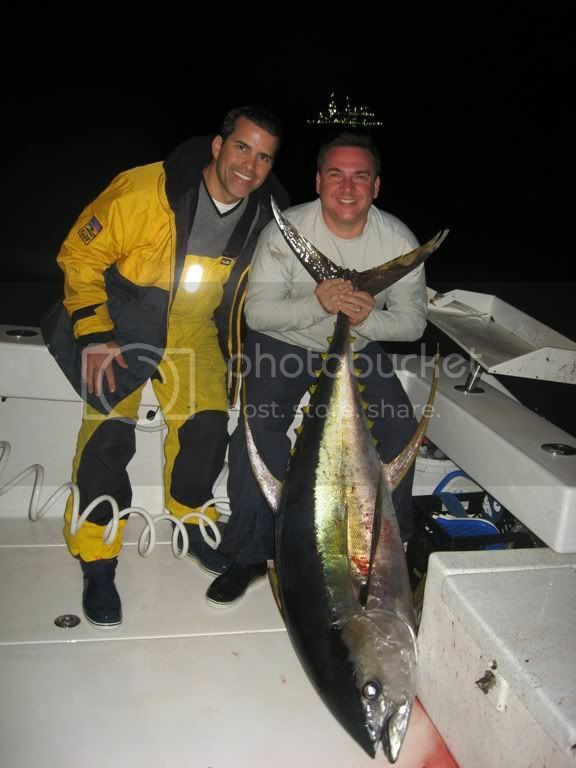 For those of you that haven’t been tuna fishing in Venice, you’re denying yourself a great time. We are finaly into our fall season which means squeezing trips in between fronts. I fished a group of dentist from Oklahoma on friday with the forcast giving us a pretty narrow window. But fortunately the front waited until I had a couple of fish left to clean before it hit. 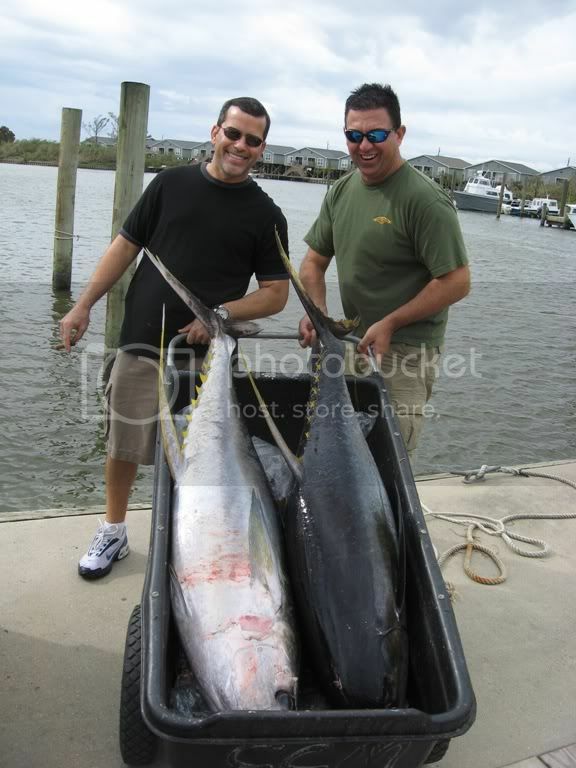 The paln was for tuna, there are plenty of real big fish on shrimp boats but plenty of boats fishing them so we decided to make a long run south to where I had been fishing and not fight the crowd. 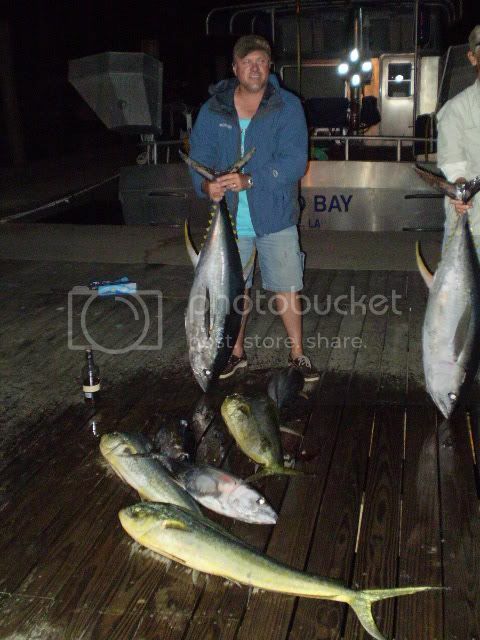 The one thing I didn’t plan on was no current but we still managed to get everyone a yellowfin. Along with feeding about a hundred baracudas in the process they always come out farther from the rig when there is no current. 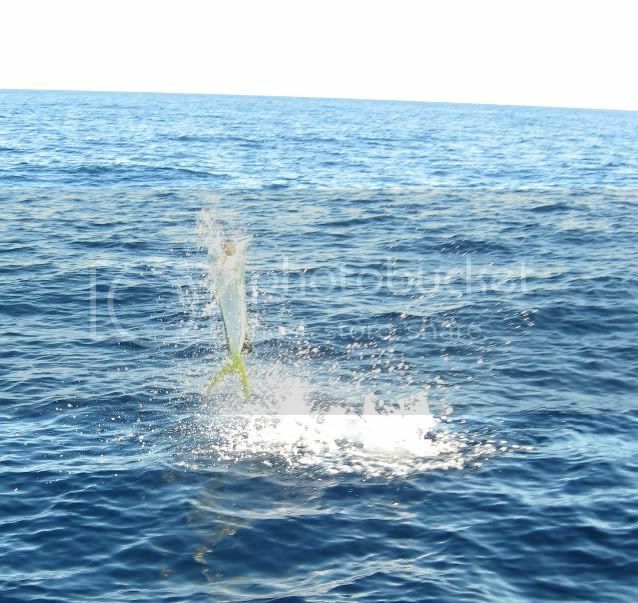 We had just finishhed boxing up a yellowfin when I thought I caught movement out of the corner of my eye. So I walked back to the transome to find a 300lb plus blue sticking his bill up the exhaust of my port engine. I went itno overdrive and pitched him a bait which he ate while I still had the leader in my hand. I don’t think that counts as a release technicialy. But still pretty cool. Anyway I feed him three times before he finaly got the hook only to throw it on the first run/jump. After that everything just died even the cudas. So we cleaned up and headed to the house and hoping to run across something in the 70 miles back to the pass. The first little break had a very weak broken grassline on it. Throw out a livebait only to have a very small blue but more than likely a white come and look at it but no bite he just faded off. 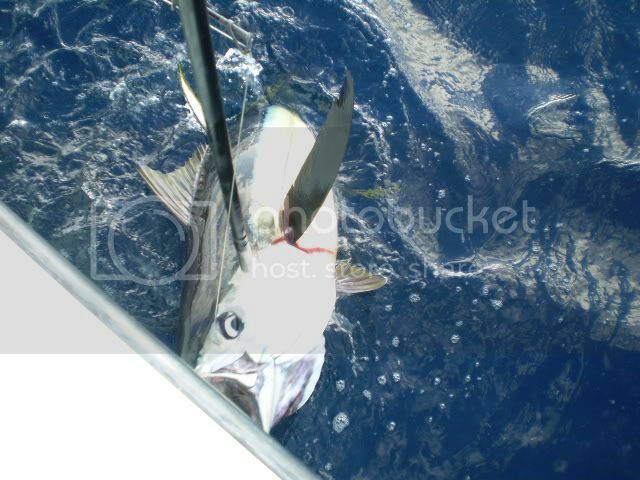 With two billfish encounters for the day I told the guys the next one we would catch. With that over we continud on and hit a real nice rip about 30 miles from the pass. I went up front a threw a popper and the water turned blue and green with dolphin. These were not the jumbo models but solid 8-12lb fish. I used the rest of my livebaits along with poppers to put 12-14 in the boat in pretty quick order. But the activity with the dolhin brought us our third encounter with a blue. He came in from under the boat and smacked a dolphin that I was going to throw back. This is where I made a dumb mistake. I pulled the dolphin in the boat and put a livebait on the hook only to have the blue go crazy looking for the dolphin I just took from him. So this is my dumb move. I took the livebait off and picked the dolphin up and threw him to the blue. But I forgot to put the hook in him. So we got to watch the blue chase and thrash the dolphin and get us wet since all this was ten feet from the boat. I could of free gaffed the first and second blue that’s how close they were. What a dumb move on my part for not hooking that dolphin. Aftert that we decided we had enough fish in the box and with the sky darkening to the north of us with the approaching front. We hooked it up and ran back to the marina. We only got a little wet as the wind and rain held off until we were just about done. We had a pretty good day and all of the icechests were filled up for the trip back to Oklahoma with happy anglers. 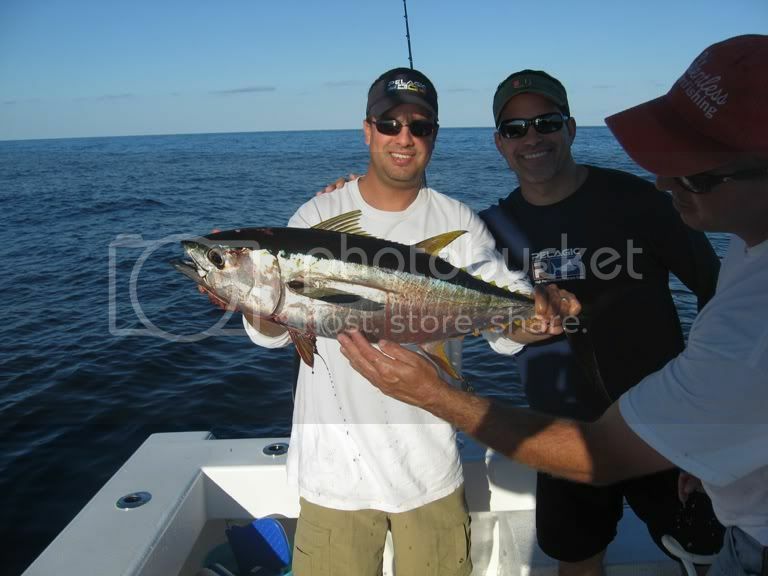 I ran a trip on saturday the 11th for Kerry of Outer Limits charters as part of a big corporate trip. We all like to only post the incredible trips but you have to post the good with the bad and the so-so trips. The weather guessers were calling for a front to come in and push the seas from 2-4 to 4-6 by late afternoon. They were wrong but only by a few hours and a few feet to start out. I got to the marina without a breath of wind so I decided to roll the dice and head to a rig a little over 90NM from the dock. As I cleared the pass things still looked perfect. That is until I hit the first of several bait stops that day. At the first spot I didn’t have a bump now the pressure starts to mount. 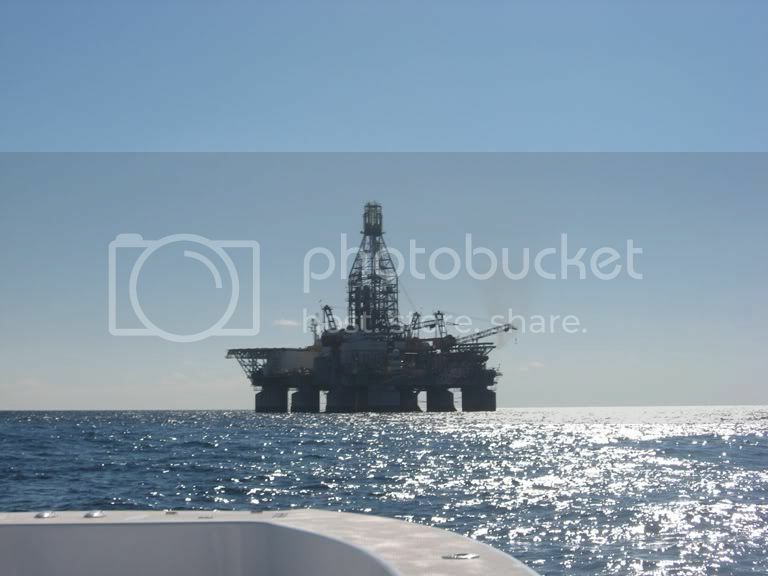 Hey no problem my next spot is only a few more miles farther offshore and in the same general direction we are headed. But as you guessed it the bait was on vacation as they were at the next three spots. 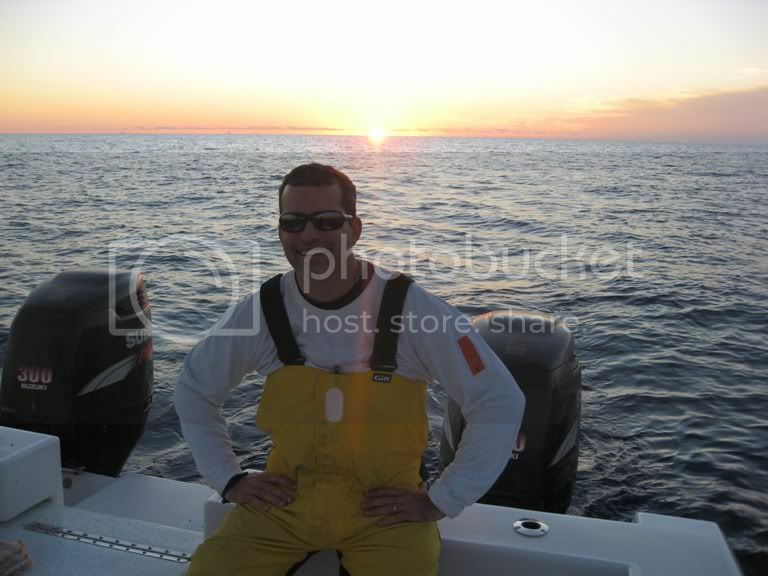 So now I am 35 miles offshore with no livebait to show for my efforts. I didn’t want to make the long run and gamble on the bait being where I was going to fish. Especialy since the bait was really thick in all the other spots I hit so far. I had to do it so off we went another 40 miles or so to the next bait (hopefully) and tuna spot. The pressure is like a ton of bricks now with no bait in the well. At least some of the pressure was off my shoulders as the next spot the perfect baits came aboard 6 at a time. Perfect right well almost the bait was there but no tuna. My crew got the bean bags back out for another 20 something mile run farter offshore. This rig had been good to me all summer so my confidence was high. Now thing started going my way to a extent. We had two swing and misses just a couple of minutes after the baits went out. 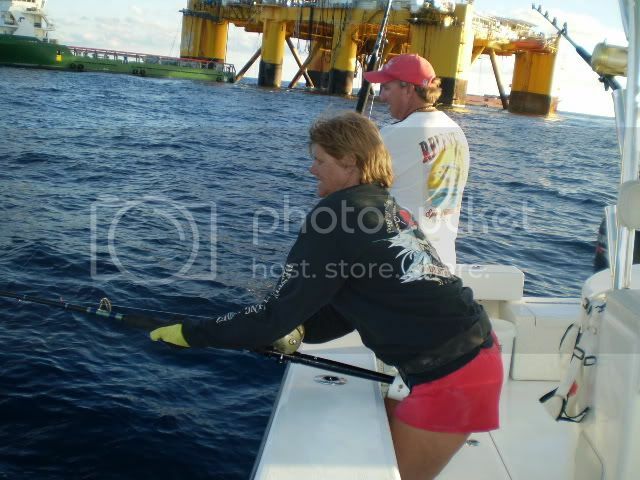 Then the rainbow runners found us and were putting a hurting on our bait supply. 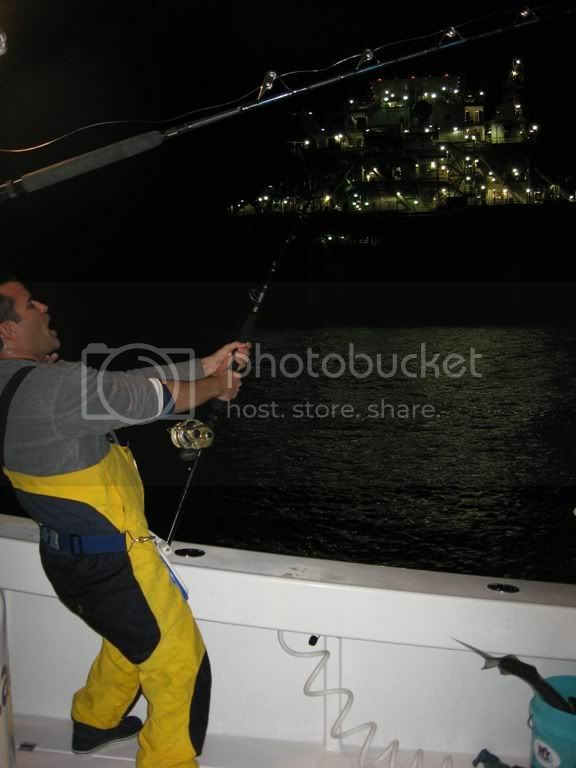 But the action was as fast as I could get a bait out and it was most of the crews first time offshore. 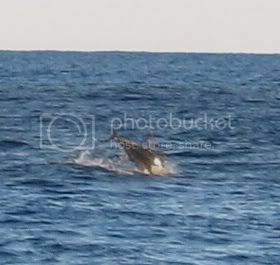 All the activity from the rainbow runners attracted the attention of a lone cow dolphin. Which was Martene’s first dolphin ever. 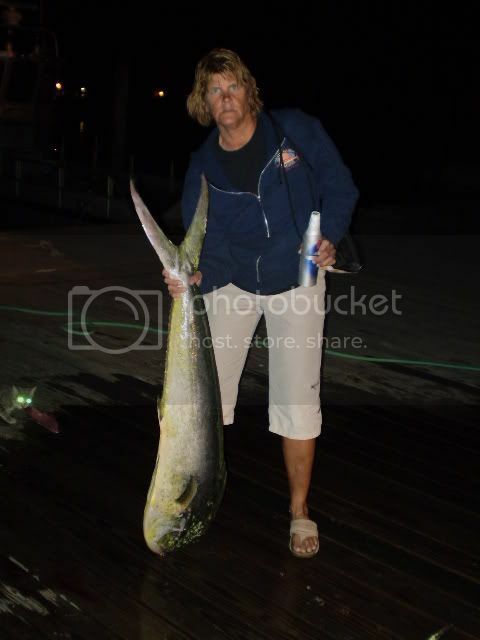 The next bite was the one we were looking for and Kelly made pretty quick work out of a 60-70lb yellow. Now I had the momentum I needed and I put out three baits to double up on the deep line and a flat line. 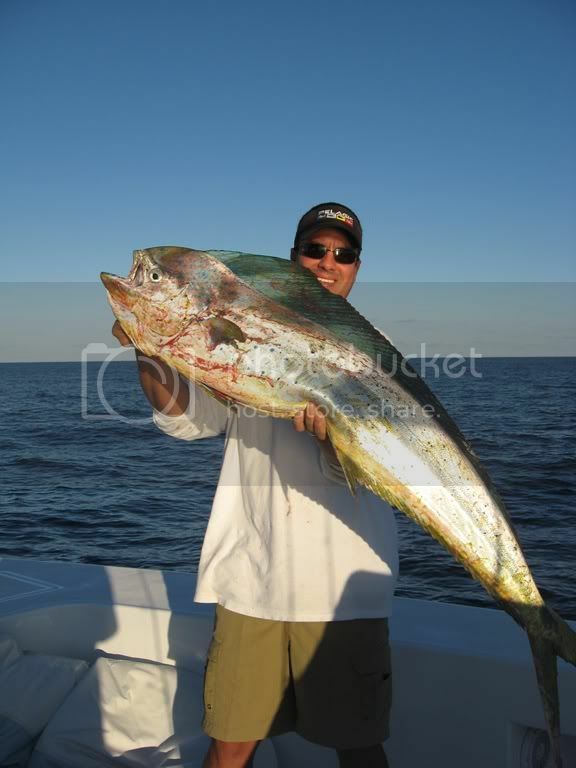 Jimmy got to eat the heart out of a 60-70lb yellow as Kelly did on his first yeelowfin also. 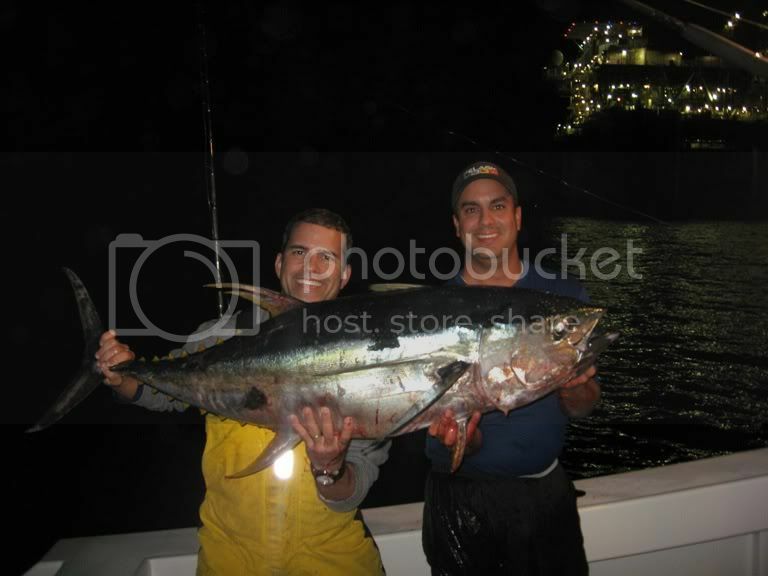 The second part of the double was a 30lb fish that was on the deep line Mike managed to keep him out of the other line. And both were soon in the fishbox. I set back up and caught two throw back yellows. And then Mike made the call to head back since they had a charter bus waiting to leave at 5PM. This was the best move made all day. Since the front that was susposed to be on top of us was still not here. And I was ready to go to another rig. But as we left the rig I heard a few radio reports of very slow fishing and with the freshning wind we headed for the marina. The weather played out pretty nice until about the last 15 miles or so then I had to stand up and actualy drive the boat and play captain. But by the time we hit the jetty it was blowing 20-25 knots the river was even choppy. I never thought he weather was that bad offshore. Maybe it was because of the awsome ride of the 33 Freeman. All in all it was a good day no fish were lost due to tackle or angler error so we were batting a thousand right there. 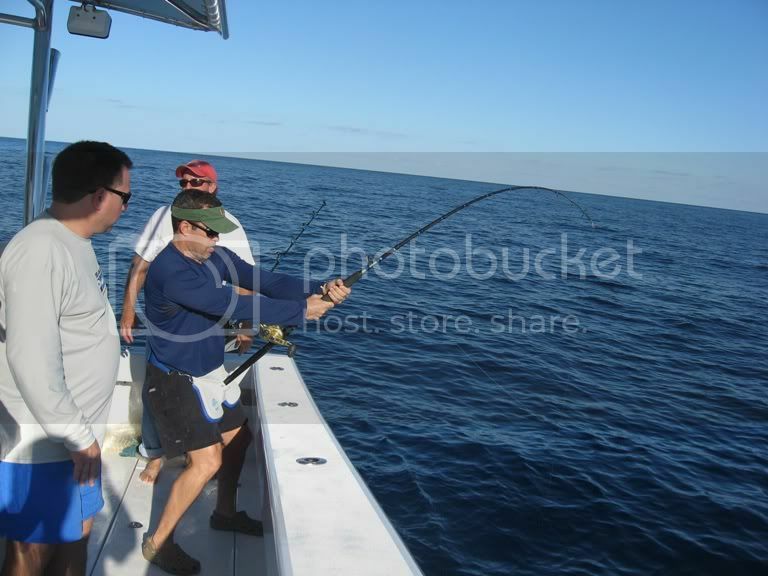 We beat the oncoming front in and my crew took the pot for biggest fish they had with the other boats fishing.